The seminar with Ada Palmer on Seven Surrenders and its prequel, Too Like the Lightning is now complete. Below, a list of the participants with links to their individual posts, to make it easier to keep everything together (a PDF will be forthcoming). All posts are available in reverse chronological order here. Comments should be open, for anyone who wants to talk about the seminar (or the books) as a whole. Ruthanna Emrys is author of the novel, Winter Tide. Falling into the Cracks of Identity. Henry Farrell blogs at Crooked Timber. De Sade, War, Civil Society. Maria Farrell blogs at Crooked Timber.In Good Hands. 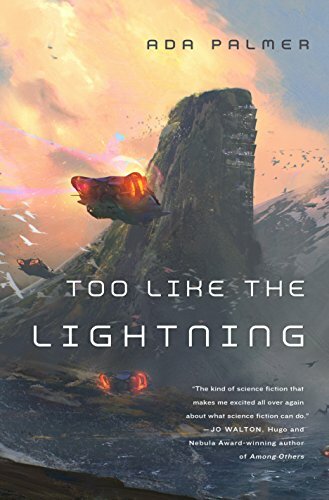 Max Gladstone is the author of the Craft Sequence books (see here for his interview on how James Scott’s Seeing Like a State can be a great starting point for a f/sf series).The Old Dragon But Slept: Terra Ignota, the Sensayer System, and Faith. John Holbo blogs at Crooked Timber. Heroes and Aliens. Lee Konstantinou is an assistant professor of English Literature at the University of Maryland, College Park.Ada Palmer’s Great Conversation. Neville Morley is Professor in Classics and Ancient History at the University of Exeter.Future’s Past. Jo Walton is the Hugo Award winning author of many books (and subject of a previous Crooked Timber seminar).Complicity and the Reader. Belle Waring blogs at Crooked Timber. Gods of This Fictional Universe. Ada Palmer is an Assistant Professor of Early Modern European History at the University of Chicago. Yay! Looking forward to it, and to Seven Surrenders too. I do wish you wouldn’t use the term “prequel” that way though. The way I prefer to use it, which I think was the original intent, is to say (for example) that TLtL would have been a prequel if the books had come out in the other order, with SS first. Amazon says my pre-ordered copy (placed months ago) will be released in November. I had to order US import. Are they finally releasing UK version, if only of first book? Neville — there is as yet no UK version. Just a note to say how much I’ve appreciated this conversation and how much it has enriched these already wonderfully rich books for me. I rushed to read Seven Surrenders because I knew these essays were here. Both the book and these illuminations have been an absolute pleasure, and I’m looking forward to reading the entire set of essays a second time in PDF. Thank you, contributors — and thank you, Ada Palmer. Has the .pdf ever come out? I have too many tabs open….